The peatland habitats that support Carex exilis are often large and remote, giving the impression of relative stability. Although there may be some truth to this, the habitats are nonetheless fragile and vulnerable to degradation on a number of levels. The most obvious threat is direct hydrologic disruptions caused by activities such as road building and ditching. Peatlands, even large unfragmented peatlands, are also believed to be vulnerable to global climate warming (Gorham 1991; Bridgham et al. 1999; Weltzin et al. 2003). It should also be mentioned that the peat itself is a commercially marketed commodity; hundreds of acres of Minnesota peatland have been drained and mined for peat. Furthermore, C. exilis is quite rare in the state, even in expansive tracts of high quality habitat where all the conditions appear optimal. Given these concerns, C. exilis was listed as a special concern species in Minnesota in 1984. Carex exilis is a perennial sedge that can grow to a height of about 90 cm (3 ft.) and forms a dense clump. The leaves are inrolled along the margins and very narrow, not more than 1.5 mm (0.06 in.) wide, and shorter than the stem. The inflorescence consists of a single spike 0.5-4 cm (0.3-1.6 in.) long. The upper portion of the spike is female and the lower portion is male, or sometimes the entire spike is unisexual. The perigynia (the membranous coverings of the seeds) are ovate to lanceolate, spreading or reflexed, 2.6-4.5 mm (0.10-0.18 in.) long, and 1-2.2 mm (0.04-0.09 in.) wide. The tip of the perigynium is tapered or contracted to a beak 0.5-1.5 mm (0.02-0.06 in.) long. 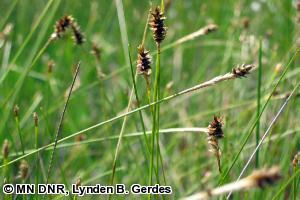 Carex exilis is one of very few sedges in Minnesota that has only 1 spike. The term bog is generally used to describe any type of peatland (a habitat where the substrate is saturated peat). However, a true bog, as described by plant community ecologists, is a very specific type of peatland (Minnesota Department of Natural Resources 2003). True bogs depend exclusively on precipitation as their source water, and they depend on the slow decomposition of organic matter for mineral nutrients. As a result, true bogs are highly acidic and nutrient poor. The peatland type occupied by C. exilis is called a fen. Fens differ from bogs in that fens are sustained by ground water rather than rainwater. As a result, fens are less acidic and have more mineral nutrients than bogs. In Minnesota, fen vegetation typically includes a high proportion of species in the sedge family (Cyperaceae), including such associates as Cladium mariscoides (twig-rush), Trichophorum cespitosum (tufted bulrush), and Rhynchospora fusca (sooty-colored beak-rush). Carex exilis is a perennial sedge that, like most sedges, is pollinated by wind and dispersed short distances by gravity and possibly water, and long distances by nonspecialized animal vectors. Within its plant community, C. exilis is a relatively large species that can form rather dense, raised hummocks. Under some circumstances it can even become a dominant and possibly a keystone species, at least at a small scale. There is published evidence that seedlings of C. exilis compete well when the water table is near the surface of the surrounding Sphagnum spp. (sphagnum moss), but they may become overgrown by the moss if the water table drops to 20 cm (8 in.) or more below the surface (Santelmann 1991). Roots of mature specimens of C. exilis reach much deeper and are probably able to survive periodic drought. The best time to search for C. exilis is when the seeds are mature, from mid-June to mid-August. The peatland habitats where C. exilis occurs are stable, late successional plant communities that are somewhat insulated from the most extreme effects of naturally occurring droughts, floods, insect infestations, and wildfire. The habitats also seem able to resist the establishment of even the most invasive non-native species, although new species are arriving on the scene almost daily. A 2005 study showed that the addition of litter had little effect on fen plant community composition or microenvironmental variables, despite a two-fold increase in litter mass compared to control plots. However, the removal of litter dramatically reduced cover of C. exilis (Weltzin et al. 2005). Barring large-scale climatic changes, it appears that if the hydrologic system that sustains the species' habitat remains intact and fully functional, there should be little need for active management of C. exilis. Several peatlands within the state Scientific and Natural Area system have relatively large and healthy populations of C. exilis. These areas receive the highest level of land protection that is available in Minnesota. Bridgham, S. D., J. Pastor, K. Updegraff, T. J. Malterer, K. Johnson, C. Harth, and J. Chen. 1999. Ecosystem control over temperature and energy flux in northern peatlands. Ecological Applications 9(4):1345-1358. Gorham, E. 1991. Northern peatlands: Role in the carbon cycle and probable responses to climate warming. Ecological Applications 1(2):182-195. Reznicek, A. A. 2002. Carex sect. Stellulatae. Pages 326-331 in Flora of North America Editorial Committee, editors. Flora of North America north of Mexico. Volume 23. Oxford University Press, New York, New York. Santelmann, M. V. 1991. Influences on the distribution of Carex exilis: An experimental approach. Ecology 72(6):2,025-2,037. Weltzin, J. F., J. K. Keller, S. D. Bridgham, J. Pastor, P. B. Allen, and J. Chen. 2005. Litter controls plant community composition in a northern fen. Oikos 110:537-546. Weltzin, J. F., S. D. Bridgham, J. Pastor, J. Chen, and C. Harth. 2003. Potential effects of warming and drying on peatland plant community composition. Global Change Biology 9:1-11.